Back in grade school days, there were rumors of a permanent record that would follow you the rest of your life. Teachers intimidated us with warnings that bad actions would go on our permanent record. We don’t think there was any such permanent record. When it comes to borrowing money, there is something like a permanent record – your credit history. Your credit history follows you, not forever with all things, but certainly for a long time. Your credit history is a record of the credit accounts you’ve held along with details about those accounts including: the type of account, your responsibility on the account (e.g. whether you were a joint borrower), the credit limit or amount of the loan, the current balance, minimum payment, whether you’ve been late in the past seven years, and the current account status. 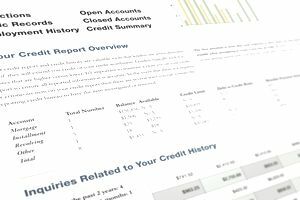 In your credit history, you’ll find the names of businesses who’ve recently requested your credit file, for example, because you’ve applied for credit or because they want to market a product or service to you. Significant credit blunders that are on public record are included in your credit history. This includes bankruptcy, foreclosure, repossession, and lawsuit judgments. Your credit history doesn’t include things like your gender, income, or whether you receive government assistance. Your credit history is compiled into a single document known as a credit report. The companies who maintain your credit report are known as credit reporting agencies or credit bureaus. There are three major credit bureaus in the United States: Experian, Equifax, and TransUnion. You have a right to view your credit history with each credit bureau. In fact, the government gives you the right to see your free credit report from each credit bureau once a year, every year. Get your free annual credit report through AnnualCreditReport.com. Certain states also give you the right to a free credit report each year. If you reside in one of those states, you get two free credit reports each year. If you’ve already ordered your annual credit reports for this year, you can purchase a single or 3-in-1 credit report from the three credit bureaus. If you do something wrong, like fall behind on credit card payment for 30 days or more, it goes on your credit history. Lenders and other businesses that check your credit history see these negative items and may use them against you when you apply for a credit card, loan, or another credit-based service. Most negative information stays in your credit history for seven years. The exception is bankruptcy, which can remain in your credit history for 10 years. While public records like bankruptcy and foreclosure are removed from your credit history after the credit reporting time limit runs out, they still remain on public record with your local court indefinitely. You have the right to an accurate credit report. If your credit history contains errors, you can have these removed by writing to the credit bureau reporting the error or to the business that reported the error to the credit bureau. In both cases, an investigation is required and the credit bureau has to remove the error if the investigation returns in your favor. If you have documents that refute the error, make sure you send copies to help the investigation process. For example, send a copy of a canceled check showing a credit card issuer received timely payment. If you’ve just turned 18 or you’ve never had credit, you probably don’t have a credit history. Even though you’re legally able to get a credit card or loan at age 18, you should wait to create credit history until you have a job with steady income. (See How to Qualify for a Credit Card.) Credit card issuers are required to ask for your income before giving you a credit card and the income will help you repay any balance you charge. Establishing a credit history for the first time can be difficult because few creditors are willing to give a credit card to a first timer. Still, there are a few credit cards for people in this exact situation. Look for student credit cards or cards for people with no credit history. Once you have a credit card, build your credit history by making small purchases and paying your bill on time and in full every month. Having a good credit history is important because it lets you keep good interest rates on credit cards and loans. You get better insurance rates, pay lower (or no) deposit on utilities, and have an easier time qualifying for a mortgage or auto loan. If you’ve made previous mistakes that affect your credit history, you can repair them. While you can’t necessarily delete accurate, negative information from your credit history before 7 years (10 for bankruptcy), you can take steps to improve your credit. These are a few things you can do. Pay off past due balances like charge-offs and debt collections. Reduce high balances to under 10% to 30% of the credit limit. Have a few active, positive accounts on your credit report. Apply for a secured credit card if you can’t get approved for any other credit card. Always keep in mind that any financial transaction has the potential to either help or hurt your credit history. Monitor your credit history throughout the year to make sure creditors are reporting things accurately.